Дискуссия «Открытая Украина в трансатлантическом пространстве – формирование совместных действий» - будет одним из этапов более широкого проекта «Открытая Украина», осуществляемого Институтом Восточных исследований в Варшаве вместе с Центром трансатлантических исследований SAIS в Вашингтоне. Его цель – создать с помощью украинских, американских и европейских экспертов рекомендации относительно структурных реформ в Украине. Дискуссия на Форуме будет проходить в то время, когда над Днепром внедряются важные реформы здравоохранения и пенсионной системы, и в решающую фазу входят переговоры с Евросоюзом о Соглашении об ассоциации и углублённой зоне свободной торговли. Кремль считает невозможным сотрудничество Украины с Таможенным союзом в формате «3+1». Именно такой неполный формат участия предлагала Украина, желающая усидеть на двух стульях - сближаться одновременно и с Россией, и с Европой. Однако и там, и там ей дали понять, что надо делать однозначный выбор. Российские власти считают невозможным сотрудничество Украины с Таможенным союзом в формате «3+1». Киев может стать только полноправным участником, как и другие члены Таможенного союза, сообщил источник в Кремле РИА «Новости». When Ukraine declared independence from the Soviet Union a mere 20 years ago, it was hard to imagine what our future would hold. The mood was one of enthusiasm and unlimited potential. But would it be enough to overpower the hardships of the previous 72 years? Despite the euphoria of the day, the country faced an uphill struggle. After all, our nascent country was struggling with weak levels of gross domestic product, and massive unemployment seemed inevitable. 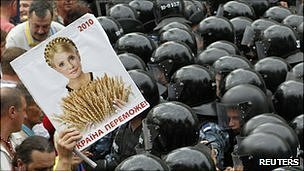 Thousands of people have protested in Kiev against the trial and detention of Ukraine's former Prime Minister Yulia Tymoshenko. The march took place on the 20th anniversary of Ukraine's independence, overshadowing official celebrations. The demonstrations were dispersed after a stand-off with police in riot gear. Mrs Tymoshenko is charged with abuse of office. Her supporters see the trial as a political prosecution designed to stop her running in future elections. Some Western governments, including the United States, have also expressed concern that the case against Mrs Tymoshenko is politically motivated. Пенітенціарна служба направила до екс-прем'єра Юлії Тимошенко найкращих спеціалістів Міністерства охорони здоров'я, проте підсудна відмовилась від обстеження. Про це повідомляє прес-відділ Державної пенітенціарної служби України. Печерський суд задовольнив клопотання держобвинувачення щодо проведення медогляду Тимошенко спеціалістами МОЗ України. EU foreign relations spokesman Michael Mann said Friday the union's deputy ambassador in Kiev has been seeking access to jailed former PM Tymoshenko for the past two weeks. "We are concerned by reports that her health has deteriorated," he added, calling for an independent medical inspection of prison facilities. A monument to the characters of the popular comedy Running After Two Hares, which was made in Ukraine at a film studio in Kiev 50 years ago has been unveiled in the Ukrainian capital. The main character of the comedy is a bankrupt hairdresser who wants to marry into money, while having a love affair with a local beauty from a low-income family. To marry, he has to borrow money for the wedding. At the same time, the beauty’s parents demand that he marry her. Embattled former prime minister Yulia Tymoshenko has told EUobserver that Ukraine's current administration is so rotten that she is afraid of being killed while she is in prison. She spoke out in a written statement sent shortly before Kiev's appeal court on Friday (12 August) rejected her request for bail. President Viktor Yanukovych's government will face negative political, diplomatic, and economic effects from the Aug. 5 arrest of former Prime Minister Yulia Tymoshenko and the accompanying legal proceedings. Tymoshenko was detained on contempt of court charges during her trial for overstepping her authority as prime minister in concluding the 2009 gas import agreement with her Russian counterparts, and for pressing the local gas company Naftohaz Ukrainy to sign the contract. She could face up to ten years in prison if convicted. According to the court decision, the reason for the arrest was "systematic violations by the accused, including impeding the questioning of witnesses." Ukrainian Prime Minister Mykola Azarov and Energy Minister Yuriy Boiko earlier made unexpected appearances as witnesses to back the prosecution's case at the trial. Ex-Prime Minister Yulia Tymoshenko's speech to the Ukrainian people, recorded before her arrest on Aug. 5 on contempt-of-court charges:Good evening everyone. 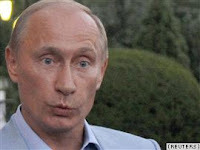 I am addressing you having just received information that Yanukovych has given orders to arrest me. Today I have every chance of obtaining political asylum in any country and protecting my life, my freedom, being happy with my family. But I’m not going to run from Ukraine. And I have good reason for this. Firstly, I didn’t violate the law. I lived and worked for you. I don’t own any factories, power plants, lands, mineral resources or government estates privatized in my favor. I made sure everything the country has served you, not thieves in politics. I didn’t break the law trying to act justly. And therefore I have no reason to run from my native land. French ambassador to Ukraine Jacques Faure will be leaving his post soon and an application for the acceptance of his successor has already been sent to Kyiv, a source in the diplomatic corps in Kyiv told Interfax. Among the possible reasons behind this decision, diplomatic sources have named the dissatisfaction of Paris with the fact that Faure recently made public comments on the trial of former Ukrainian Prime Minister Yulia Tymoshenko that were disappointing to the Ukrainian Foreign Ministry. Ukraine's former Prime Minister Yulia Tymoshenko, on trial over the 2009 gas deal with Russia, demanded during a court session on Friday that testimony given by the country's current premier, Mykola Azarov, in Russian be translated into Ukrainian. 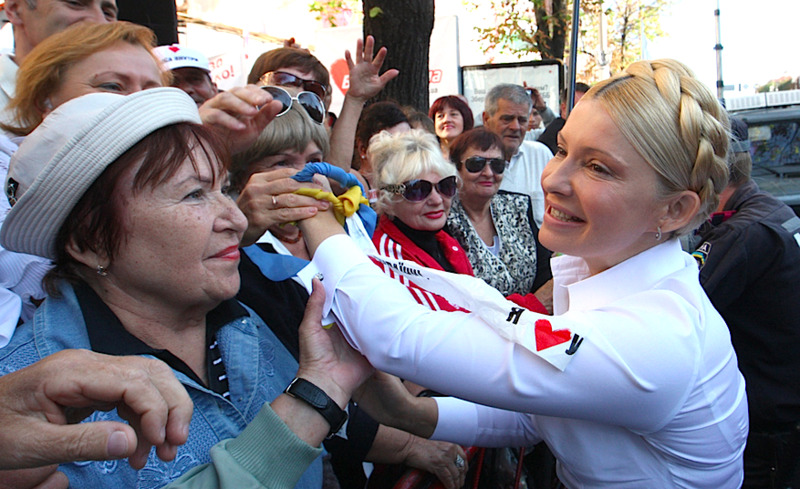 "I understood nothing from what Azarov said, not even a word," Tymoshenko, a native speaker of Russian, told the court. "I don't understand Russian." БЮЧ - Кто подставил Януковича? В данном случае, для меня более интересно не кто, а умышленно подставили и не умышленно? По моему сугубо личному мнению-не умышленно. Виной всему, как мне кажется "головокружение от успехов" членов команды действующей власти. Попробую нарисовать сценарий данной ситуации, который у меня лично созрел в голове. Итак, моя версия развития событий. Янукович победил. Начал формировать вертикаль власти. Процесс прошел на удивление легко и без особых сопротивлений как внутри страны, так и без особой критики вне ее. И началась эйфория. Казалось, что весь мир в кармане и можно делать практически все что хочется. Всупереч очікуванням тема придністровського врегулювання випала з порядку денного зустрічі Меркель і Медведєва 19 липня, де, як очікувалося, у тому числі й російською стороною, вона повинна була стати одним з пріоритетів. Російська сторона сподівалася отримати поступки з боку Німеччини і підтримку по ряду питань у переговорах з ЄС в обмін на конструктив із боку Росії у придністровському питанні, зокрема, на сприяння запуску офіційного переговорного процесу у форматі 5 +2.